COCOA BEACH and PORT CANAVERAL, Florida -- Event organizers for the 2016 "Thunder on Cocoa Beach" super boat race addressed concerns many locals have about potential harm to sea turtles on the beach and in the ocean. "Each year we work hand in hand with the Sea Turtle Preservation Society to ensure the safety of sea turtle nests and turtles in the waters off Cocoa Beach," organizers wrote in their Facebook page. During the month of May, both leatherback and loggerhead sea turtles are nesting along Brevard County's beaches. Florida's Space Coast has more loggerhead nests each year than anywhere else in the United States. Last year, the Florida Fish and Wildlife Commission counted 23,977 Loggerhead nests on Brevard County beaches. "For the entire week leading up to the races we have spotters on the beach every morning looking for nests. If any are found they are marked and roped off. If the nests are in areas where the race event takes place we have a contingency plan in place to move the event setup as to not disturb the nests," organizers wrote. 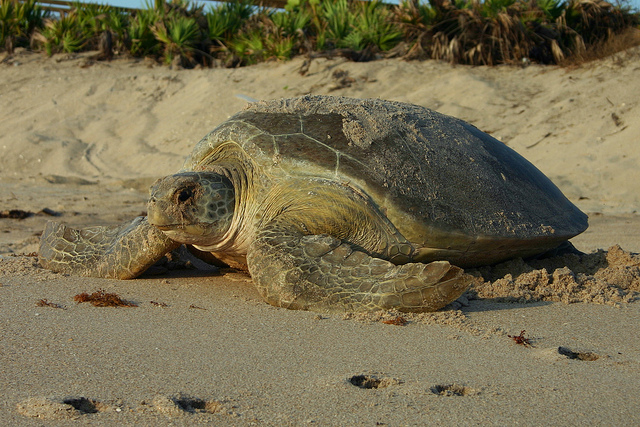 In addition to leatherbacks and loggerheads, Kemps Ridley and green sea turtles inhabit the Atlantic Ocean off the coast of Cocoa Beach and inside the mouth of Port Canaveral. "During the races we have our "Turtle Spotters" in the air flying with Florida Air Tours and Super Boat International, in boats on the race course and on the beach," wrote organizers. "If any turtles are on the race course before the races we will not begin until they are safely off the course. If any turtles are spotted during the races we will throw the caution flag and the boats will stop until the course is cleared. Neither of which has ever happened. Thanks to our dedicated Turtle Spotters, the staff at the Sea Turtle Preservation Society and our wonderful race fans there has never been an injured sea turtle or turtle nest in the history of Thunder On Cocoa Beach and we will work tirelessly each year to keep it that way." On May 15, 2016, the first super boat race start time is at noon, followed by a second race that begins at 2 p.m. The race route runs from the Cocoa Beach Pier to Lori Wilson Park. The race will also pass Fischer Park, and Shepard Park. Photo credits: Sea Turtle / FWC. 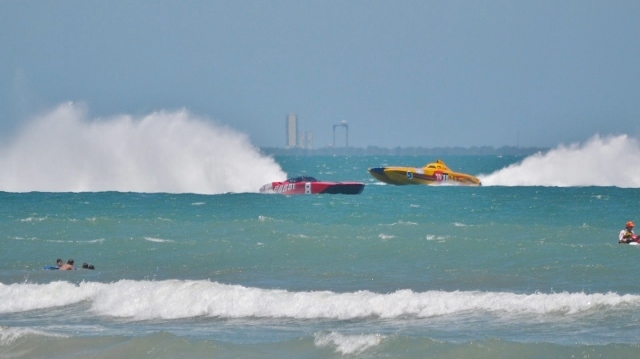 SuperBoats / Brevard Times.